SAFFIRE just released a live music video for the song "Where The Monsters Dwell", taken from their third album Where The Monsters Dwell on Perris Records. The video was filmed at Sticky Fingers, May 18th 2018. SAFFIRE just appeared at the Helgeåfestivalen in Sweden July 5-7th along with H.E.A.T, CRASHDIET, THE QUIREBOYS, ELECTRIC BOYS and many more. Perris Records is proud to release Sweden's hard rock band SAFFIRE Where The Monsters Dwell CD worldwide April 20th. For fans of 80's melodic hard rock like DEEP PURPLE & RAINBOW. SAFFIRE was formed in 2005 when Victor Olsson and Dino Zuzic were in school together. The idea was to form a band based on old school melodic hard rock and heavy metal but add a modern twist to it. After months of searching and auditioning, the duo was joined by Magnus Carlsson, Martin Järbur and Gustav Elowson. In 2007 they recorded a first demo but soon after, Gustav had to leave the band and was replaced by then 17-year old Anton Roos, who had just won the Swedish Drum Solo Champion of the year contest. Another demo was recorded in 2008 and SAFFIRE started playing shows in the local area, slowly making a name for themselves. In 2010 Martin was replaced by Tobias Jansson, and an EP was recorded and released. 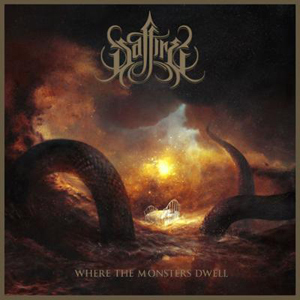 The band kept playing lot's of live shows and finally in 2013, SAFFIRE signed with Inner Wound Recordings for the release of their debut album From Ashes to Fire. The album was highly praised all over the world, and Rocknytt.net, Sweden's biggest rock website, put the album on their top 10 list of the best albums of 2013. SAFFIRE went on to tour all over Scandinavia, playing some of the biggest festivals like Sabaton Open Air, Tons of Rock Gothenburg Sound Festival alongside bands like SLAYER, STEEL PANTHER, AT THE GATES and SABATON. In November 2015 they released their second album For The Greater Good. The album was, as its precursor, highly praised all over the world. In January 2016 they held a sold out release show in Gothenburg which followed by a co-tour together with SPIRITUAL BEGGARS in the spring. During the summer of 2016 they played many of the big rock festivals in Sweden which includes Sweden Rock Festival, Metallsvenskan, Skogsröjet and Rock in Lisch together with artists like QUEEN, GHOST, TWISTED SISTER, THE HELLACOPTERS etc.